8 3/4" Clear Crystal Outline Star on Black Base. Clear crystal is cut, beveled and joined to create an outlined, curved 5 point star. The slant top of the black crystal base gives the illusion of the star rising out of it. Personalize the star, the base or both to honor the rising stars in your organization. This premier crystal star is packaged in a velvet lined gift box for added elegance. 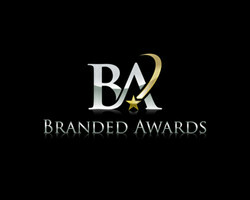 © Branded Awards Website design and development by Americaneagle.com, Inc.